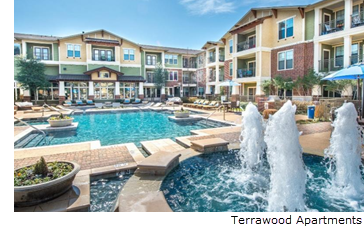 ​​ GRAPEVINE – The Terrawood Apartments, at 3225 Grapevine Mills Blvd., has been acquired by New York City-based The Praedium Group. The 291-unit apartment community has amenities, such as a salt water pool and private dog park for residents. ​Check out DFW Multifamily Market Research for quarterly reports from commercial real estate firms.